In Spain, we often use this word to describe an artist’s magical ability to transport us into another realm… picture the journey a classical guitarist takes you on as you listen to the enchanting melodies that he conjures up… they may come inspired by the scent of dama de noche on a late summer night, the other-worldly shade of blue he witnesses when the sun looks you in the eyes, or from the memories of lifetimes past in Moorish gardens when declarations of intent were sent by a messenger on a horse. When you create something so pure and so honest, you cry with joy because you have no idea where the inspiration came from, and you want your Muse to stay forever. It’s a feeling… something intangible, je ne sais quoi, there-is-no-word-just-a-curious-feeling kind of feeling. It’s out of the box. An unknown that you might fear until enough curiosity has grown inside of you to reach a flipping point, allowing the unknown to be known, and the unseen to be seen. And suddenly, you wake up to your own duende. It was never lost, you just stopped looking. And then you easily recognise it in the others around you. You see them for who they really are, and you breathe a sigh of relief. No, you’re not. And you never were, my dear friend. Like the permeating scent of that night flower, wrapping you in its gentle confidence, whispering in your ear as you sleep, reminding you that tomorrow your dreams will still wake up with you, stronger than before. More colourful. More vibrant. More committed. More in tune with you. Trusting that what is meant to be, already is, simply because you dreamed it, and you are aware now that it’s up to you to make it happen. Gone are the days when you nervously took two steps forward and one step back with no compass other than hope. Now you can take confident consecutive steps to meet what you most desire. One by one, day after day, watching it all come together so nicely because the road is easier to navigate now that you trust your inner guidance. It’s showing you the way and new ways of doing things. Now that’s what we call ‘magic’. Asking becomes easy. Sharing becomes easy. Allowing becomes easy. No matter how high the walls of a garden, no flower, no matter how seemingly delicate, or whatever obstacles in its path, ever stopped from making its way to the top and finding the sunshine it knew was always there. Because it’s been there since before you opened your eyes to it. And in those silent moments, when you felt nothing was happening, the flower grew stronger roots to support its journey into this new realm of amazement. It was never soul seeking, it is soul seeing. 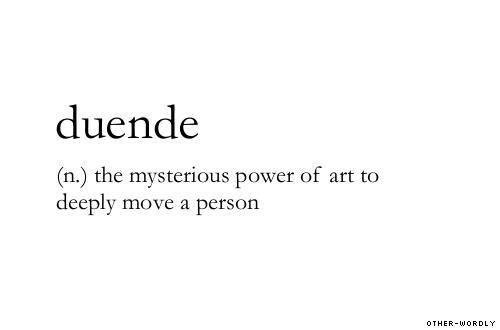 Duende… The spirit that dreams are made of, and how they come to be real. Trust yours now. It will bring you closer to those who are already sharing theirs with you. And when you feel even the slightest flurry in your soul, embrace it. It’s telling you that what you’re seeking is already seeking you, already found you. And you’ve known this all along… haven’t you? Turn a new page in this book you kept looking at and thought you’d never pick up, let alone read. And then all the stories it tells you make sense now. The rest is still unwritten… And that’s okay, because you don’t need to know or do everything right now. The fear is gone and you’re so intrigued by what’s next that you have no time for doubts or confusion anymore, do you? Your Master Plan is made up of smaller plans that come together as key elements for your highest intentions. And as you consciously allow them into your existence, your inspiration touches others around you too.